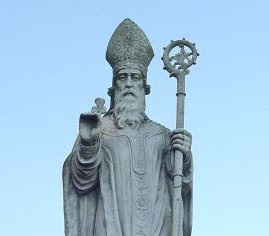 St. Patrick was a real, historical person, though not all the stories we associate with him are necessarily true. He had quite an adventurous life and boldly and almost singlehandedly persuaded the Irish that God was much kinder than the bloodthirsty spirits they worshipped -- kind enough to die for them, rather than insisting they die for him. On this St. Patricks Day, between sips of green beer, take a listen to this narration of his autobiography, released in a Librivox recording just the the other day. In the meantime, I present you with this ancient and powerful celtic prayer known as The Breastplate, possibly composed by Patrick himself.